I am surrounded by friends!! “Not a problem, at all”, said I. And it really was not, since I was actually writing my blog post about the very person who was talking to me – Suranjan-da!!! As Suranjan-da stepped back to his table to re-join his family for dinner, I realized the real reason he had introduced me to Subhra. Turns out Subhra and I have more common friends than we could literally count on our fingers. And the funny thing is that our paths had never crossed before. We had never studied in the same schools but had enough common friends that we studied with – obviously at different points of time. He was even the bench mate in eleventh and twelfth grades with Avijit who was my best friend and studied with me till tenth grade. As we were discovering many of those common connections – some even starting from my first grade like Mallika – I realized something. His family was waiting outside the restaurant door for him. I did the quick math and realized that they had just finished their dinner and was on their way out. Torn between whether to let him go or pull his family into the discussion as I continued to plough thru the fertile grounds of “intersection points”, I did what you probably might have guessed – got his family into the discussion too!! “Name certainly sounds very familiar. Cannot put a face to it though”. “Wait”, I said and fished out my phone and showed her a picture of the subject of our discussion. 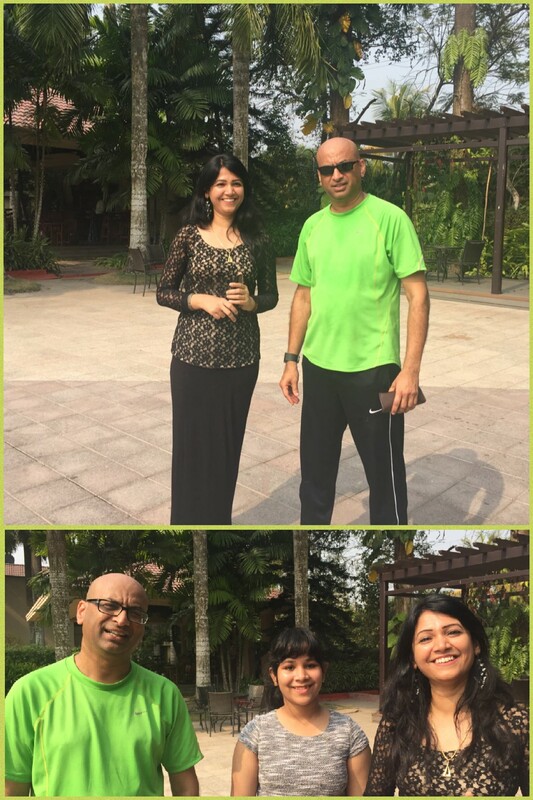 A few long seconds of laughter back, we caught up on Sharmila’s friends too. And by that I mean I updated her on the latest status of Sharmila’s friends!! The one thing I want is my daughter Natasha to meet their daughter Ishita. They are the same age and have the same love for the language English. While Natasha is tending more towards the journalistic side, Ishita wants to go the teaching way. Oh! did I mention that both of them apparently share the view that parents serve the sole purpose of embarrassing their kids? 🙂 Believe it or not, we actually talked about it!!! Somewhat reflecting, I realize we are about half an hour to the new year here in India. The day started by concluding a great three days resort stay with the three families I know the longest – my own. 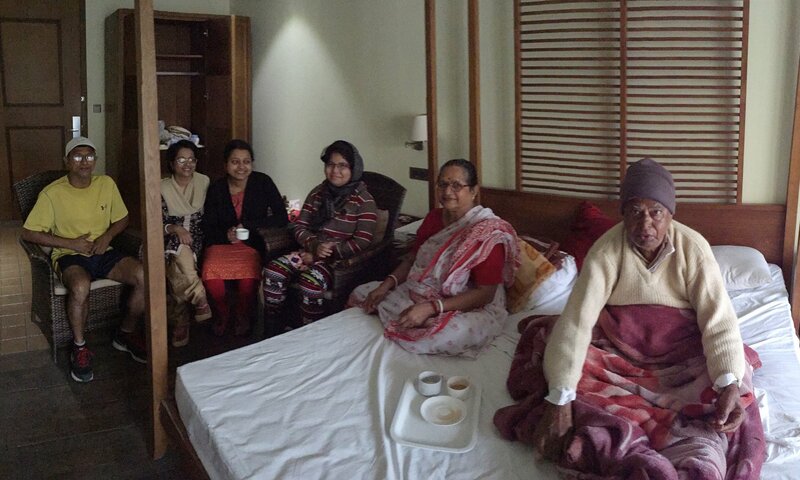 And then in the last six hours, I got to know three of the most wonderful families – Sujan’s, Suranjan-da’s and Subhra’s. One a classmate, one a brother of a classmate and one I had never known in my life! If I can end every year on this kind of a note, I reckon, I am way ahead of the game!!! Unlike most New Years’ eve revelers, I had decided to take it easy and retire early. No surprises there. 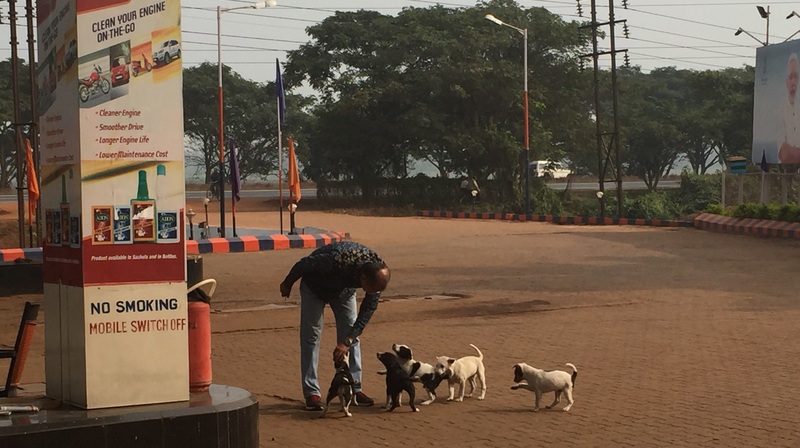 After seeing my brother’s family off – who headed to his in laws’ house in Durgapur, I went back to the hotel room, grabbed the phone and the laptop and went down to the restaurant bar downstairs to write down about my intersection points. Sitting in a corner, I was writing about my trip to Sujan’s house when I heard somebody nearby say – “Rajib?”. I looked up, somewhat surprised that I would find somebody here who would recognize me – although, I have to admit that I absolutely stand out with my shaved head in these parts of the world. And it was Suranjan-da! Suranjan-da is my classmate Sumantra Kar’s brother and a senior of mine from my elementary and middle school. I cannot even remember when I saw him last. Maybe when I was in sixth grade? 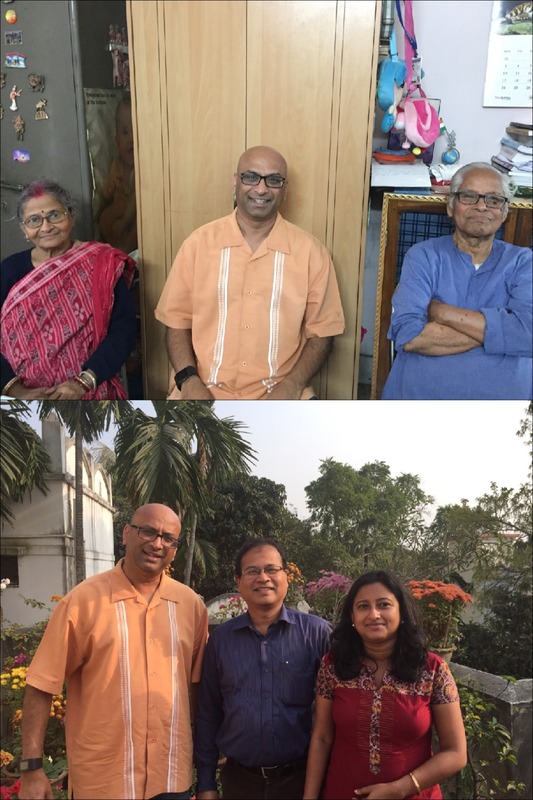 It was a delightful fifteen minutes catching up with Suranjan-da and more importantly, getting introduced to his family – Suvra-boudi and his two daughters – Saranmoyee and Sulagna. 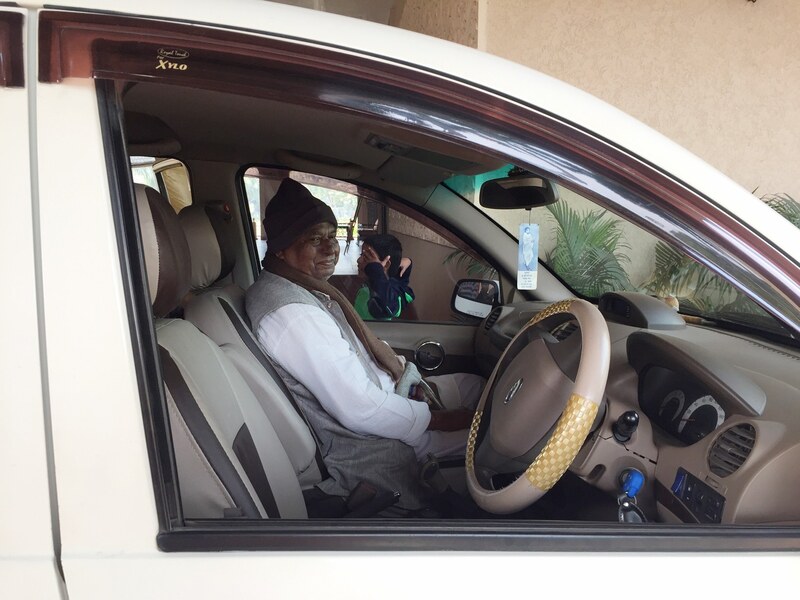 I got to know a lot about the cause that Saranmoyee’s NGO focuses on – Livelihood. I have to admit that I take so many things in life to be granted that till I meet causes like what Saranmoyee works for, I fail to remind myself about how blessed we are. It was also great talking to Sulagna about her aspirations of becoming a MBA graduate. It certainly brought back memories from my old MBA exam days!! I am really glad that I did not go to bed immediately and certainly very elated about shaving my head without which Suranjan-da might not have recognized me and I would have missed getting to know a beautiful family. Having seen my parents off, I hit the road with my brother heading out to Durgapur to meet my in laws and hopefully a few more folks from my past. On the way there though, there was a place I needed to drop by. I had found out the whereabouts of Sujan Sarkar a few months back and was hoping to see him, his family and his parents once during this trip. Of course, the challenge with a very successful doctor is to somehow fit in their calendar. So, a few phone calls later, the time was fixed to meet at his home. It was a little inconvenient time for most households, but I did not have too many options open. As we greeted each other at his house gate, my first words were – “What, it has been over thirty one years? 1985 right?”. You see Sujan and I studied for a couple of years in a residential school for my eleventh and twelfth grade. And I had not seen him ever since. Or so I thought. “Thirty years, to be precise. We had met in my medical college in 1986 when you came to meet Piyali, Madhumolli, Mausumi and the rest of the gang from Durgapur”. I distinctly remember that day when I had gone to Calcutta Medical College and hung out with Ansuman, Sudipta and all in the evening. Apparently, I had met Sujan too but I had forgotten. I was certainly glad that he remembered me so distinctly. The best part of the trip was sitting down and talking to his parents. They are both older than my parents. But I was delighted to find out that they are in a great shape health wise. And mentally too. During the whole time I talked to them, they seemed to always accentuate the positives in life. I am starting to conclude that a positive outlook in life and staying physically healthy are very highly correlated. 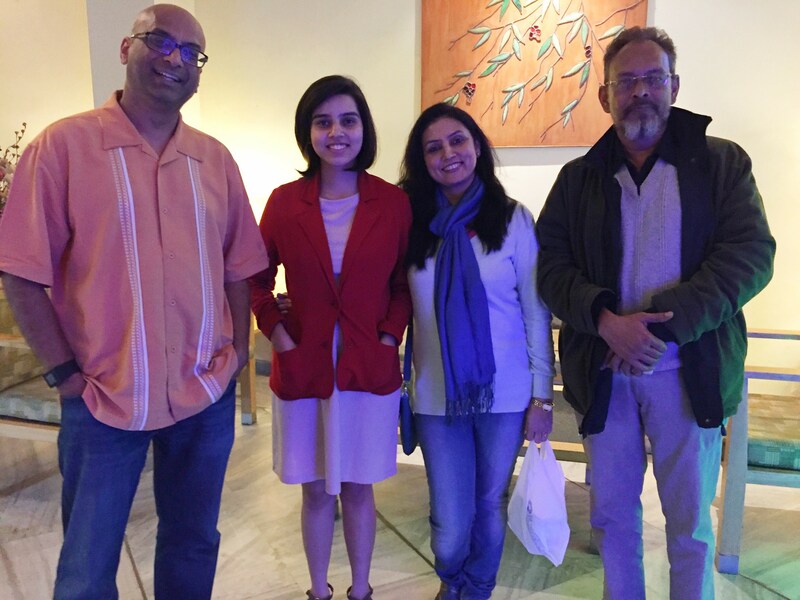 It was also great to meet his wife Rupa (who completely coincidentally is from a place very close to the resort that I had taken my parents to) and his daughter Teesta. Teesta was having a get together at her home with about twenty or so of her friends. In a move that is sure to draw derision from my two daughters, I totally walked into the crowd and started making friends with the youngsters. I even got them to line up for a photo op. 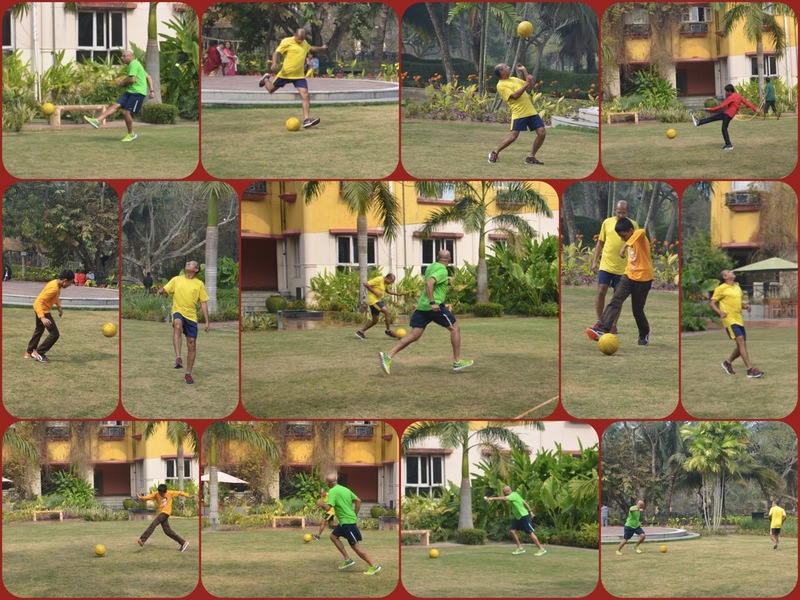 A memorable moment with the youngsters…. “So, what are the New Year’s resolutions”? Most were shy and mumbled. One boy, however, was very clear. “Sir, in the new year, I am going to think once, twice and even thrice before I do anything”. “Why?”, I asked, “did you get in trouble for not thinking things thru”? “Yes, sir”, he candidly admitted. 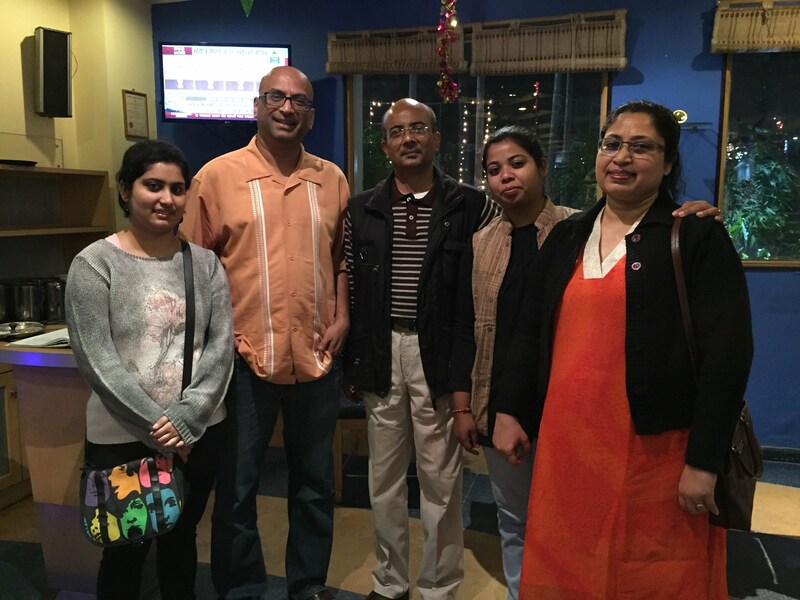 It was memorable to get to see Sujan and his family. It was worth every bit the wait and the effort. Everything worked out picture perfect. He did follow thru with his word to the niece and nephews that he will come. Mom insisted on joining us for the evening drinks each of the three days. Last evening, in fact, she asked for another mojito!! Time to say Bye for now. And with that, I slipped into the other car to achieve as many of the other objectives as possible…. Getting frustrated with a peer CEO who canceled our meeting. 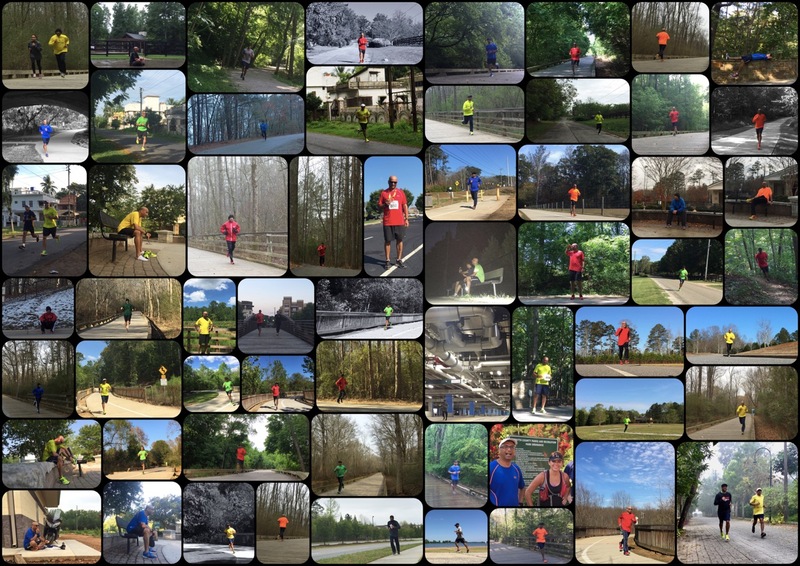 So I went for a run in his city instead (bottom most picture from the above picture). Today, I was again with the family and by the pool when, guess who I ran into? Paramita Ghosh – who turns out to be the better half of a classmate of mine from high school (eleventh and twelfth grades). I have not seen him since 1985. But Paramita and I agreed that we will try to fix that problem in a few days when I am in Kolkata for a few hours. We also met her daughter Amrita who became an instant hit with my family with her shy, quiet ways and absolute candor in accepting that she is not the biggest fan of studying!! Looks like Amrita, Paramita and Natasha share a common love in writing!! Long after she was gone, my mom kept talking about her. My sister concluded in a typical Bengali way – “Ekkabarey doll-putul”. [Ekkabarey means “totally” and “Putul” means “doll” and do not ask me why we repeat ourselves when we say “doll-putul” !! You think he is having a good time? He seems to have gotten some of his mojo back. 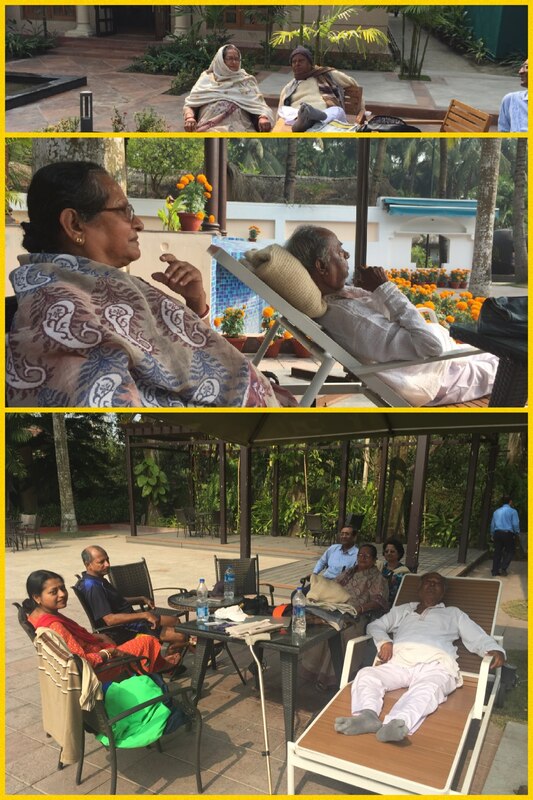 He is cracking jokes, telling the grandkids stories and most importantly having a friendly banter with mom! The nephews are yet to wake up.